Reconstruction in front of Station 11 and a popular hamburger stand leaves little room between sidewalk and traffic. One result of the sidewalk extension is the disappearance of the space that bicyclists were able to use to get out of the travel lane along this section of Lyon Street, the northbound leg of the heavily used Highway 20 couplet downtown. “Lyon has a curb width of 42 feet. The original striping was for two 13’ vehicle lanes and 8 feet of on-street parking along both sides. Along sections where parking was restricted or not being used, cyclists could cheat over into that area but would have to shift back into the travel lane when approaching parked vehicles. I know it’s tempting, but it’s probably more dangerous for a cyclist to shift back and forth between parking areas and vehicle lanes than to just maintain a constant course. 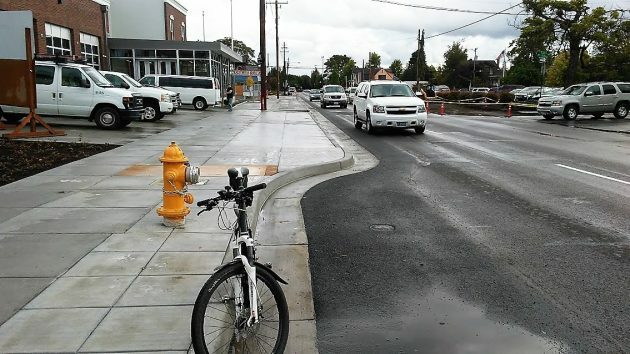 “I’ve not seen any studies on the topic, but I do recall Michael Ronkin (ODOT’s past bike/ped manager and one of the best bike design experts I’ve run across) advocating against the practice unless the empty parking area extended a significant distance. Michael thought that cyclists moving back and forth between parked vehicles increased the chance of being hit by a surprised semi-attentive driver. There are no designated locations for cyclists to ride on Lyon or Ellsworth, and no way to get to a striped bike lane without removing parking on one side of the road. 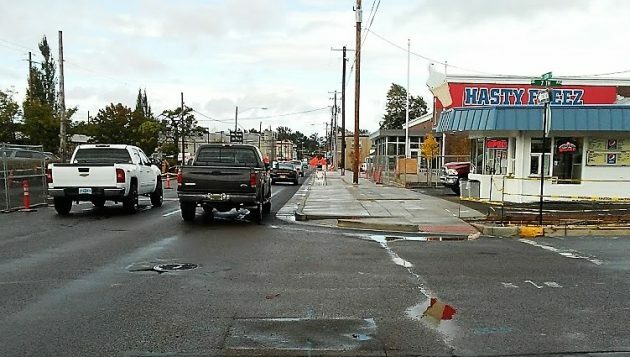 “The curb widening we’re doing on Lyon at curb extensions and at Hasty Freez is 6 feet. That will result in a lane width at those locations of 15 feet. That’s less space than used to be available at locations with no parking, but more space than the 13 feet that is available along most of the corridor next to parked vehicles. The sidewalk extension on Lyon Street looking south past Station 11. What you don’t point out is that it looks like there is now room for a picnic table in front of Hasty Freez. Can’t wait to try out my new dining room table! If it wasn’t in the design, should be an Alt-Design and maybe the seed has been planted. Well done GA! I like it!!! City better consult with Mr Irish about curbing speed to 10 MPH through there. No? Safety first. Not thrilled with this. Sharrows don’t do anything on a street that busy except make it more dangerous for cyclists. The best thing a cyclist can do is to make sure they take a decent portion of the lane, to avoid being sideswiped. Make cars move over to the other lane. This works well in smaller residential areas or high traffic, low speed areas, but those stretches of road are treated as raceways by motorists, a practice that is often overlooked by police. 5-15 mph difference in vehicle speeds means life and death to a biker. I see cars all the time doing 30-40 through there. Ron Irish is so out of touch with cycling, he actually thinks the traffic sensors for bicycles work! Perhaps (with) sharrows in tandem with other traffic slowing measures the area could be safer for bikes. A picnic table and plantings may encourage people driving by to consider the area more carefully and not just as a thoroughfare to the bridge. Maybe another Parklet? Other solutions such as blinking lights like a pedestrian crossing or those on the Ellsworth Street Bridge could be used? Put some turns in the road to slow traffic? That said, there now seems to be less room for bikes on a road many folks just want to use to drive quickly on. The real question here is why did Hasty Freeze leave a rectangle devoid of cement right in front of the building? I haven’t stopped by there lately (trying to maintain my svelte figure) to ask for myself, so I’m banking that someone on this forum will know. My theory is that they plan to plant flowers to run over the sidewalk in the summer. Outrageous that a business’ personal interests should gobble up roadway. And Bicycles and Cars have Always been a really Dumb mix. The business had nothing to do with the sidewalk design.